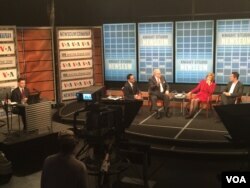 Left to right: Mil Arcega, Gene Policinski, Baroness Emma Nicholson of Winterbourne, Lorenzo Vidino and Harun Maruf discuss ISIS’s use of propaganda during a town hall at the Newseum in Washington, D.C., Oct. 21, 2015. The Islamic State group has mastered the use of social media to promote its cause like no other extremist organization, experts on the group said Tuesday in Washington. The panel discussed the Islamic State group's adept use of social media and propaganda to recruit members worldwide in a joint forum, called ISIS and the Digital War, conducted by the Voice of America and the Newseum. The Islamic State group differs from its predecessor, al-Qaida, in delivering its message, said Lorenzo Vidino, director of the Program on Extremism at the Center for Cyber and Homeland Security at George Washington University. Where al-Qaida released long, verbose statements by leader Osama bin Laden, Vidino said, the Islamic State group has been able to "capitalize on social media. ... They have the ability to market that message in a very clever way." Right to left: Lorenzo Vidino, Baroness Emma Nicholson of Winterbourne, Gene Policinski and Mil Arcega discuss ISIS's use of propaganda as Andrew Palczewski, far left, monitors social media during a town hall event at the Newseum, Oct. 21, 2015. Harun Maruf, senior editor with VOA's Somali news service, said al-Qaida used to issue videotaped messages, but the Islamic State group has "mastered social media like no other extremist organization." And they are quite effective, Maruf said. "This recruitment takes place in very short time," he said, sometimes within a few months." The Obama administration announced earlier this year its multipronged campaign to “degrade and defeat” the Islamic State group, and one of the main components is efforts to combat the extremist group’s online messaging and recruiting. “Ideologies are not defeated with guns. They are defeated with better ideas,” President Barack Obama said in July. “This larger battle for hearts and minds is going to be a generational struggle." Vidino, an academic and security expert who specializes in Islamism and political violence in Europe and North America, said the Islamic State group has also been "very effective" at sending its message out to different audiences, especially the young. 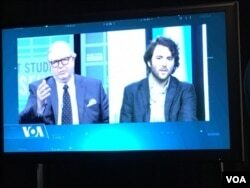 Journalist Michael Weiss, right, participated in a VOA-Newseum forum discussing ISIS’s use of propaganda during a town hall at the Newseum in Washington, D.C., Oct. 21, 2015. Gene Policinski, chief operating officer of the Newseum Institute, said young people tend to get their news from other people their age or their friends. He said the message seems attractive to youth because it is selling a "utopian" view of the religion. Michael Weiss, an American journalist specializing in Syria and the Middle East and a senior editor at The Daily Beast, agreed in part, saying the Islamic State group has "a coherent narrative, it’s very attractive and it's conforming." However, the Baroness Emma Nicholson of Winterbourne, president and chairwoman of the AMAR International Charitable Foundation, said the message is completely un-Islamic. "They don't know anything about Islam," said Nicholson, who regularly travels to Iraq and leads the charity's work to support hundreds of thousands of more than 3 million Iraqis displaced by Islamic State militants. According to Islam, "you can’t show any image – all this social media is absolutely un-Islamic." Vidino said the recruitment materials appeal to a certain segment. "People who join are seekers of knowledge," he said. "Forty percent are people who do not have a clue about the basics of Islam -- so they go online." Both Maruf and Nicholson said families are key when trying to combat the Islamic State's slick media message and signs of radicalization. Maruf said families should watch for warning signs, such as changes in behavior or complaints about the West. The recruitment "happens in chat rooms, it happens in home," he said. Nicholson suggested a "wholly round" approach involving "every single level of society." She mentioned a program her charity has developed in southern Iraq that fosters religious tolerance that has been successful. Vidino, of George Washington University's extremism center, said society has a major role to play in combatting the radical Islamic State message. "The best actors that can prevent and deradicalize (someone) are members of the community -- relatives, religious people." Weiss, who has reported on the group for several years, suggested a two-pronged approach: stem the flow of foreign fighters and engage the government of Syrian President Bashar al-Assad. 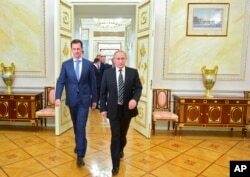 "I have argued... until you engage the Assad regime, that government is a magnet for jihadist elements," he said. Russian President Vladimir Putin, right, and Syria President Bashar Assad arrive for their meeting in the Kremlin in Moscow, Russia, Oct. 20, 2015.. When asked if moderate Muslims needed to take a more active role in countering the Islamic State message on Islam, Nicholson and Weiss bristled. "I think it’s enormously unfair to turn to a particular segment of society and say this is your problem," Nicholson said. "You don’t put on the shoulders of every Muslim to denounce ISIS," said Weiss, whose book, "ISIS: Inside the Army of Terror," was published earlier this year. In it, he explains how the Islamic State group, also known as ISIS (the Islamic State in Iraq and Syria), evolved from a nearly defeated Iraqi insurgent group into a jihadi army of international volunteers who have conquered territory equal to the size of Great Britain. He said Tuesday, "If you look at the upper echelons of who runs ISIS today [with the exception of leaders Abu Bakr al-Baghdadi and Abu Mohammed al-Adnani], everyone behind those two is a former member of Saddam Hussein's regime." Operation Inherent Resolve, as the U.S.-led coalition's military operation is called, began airstrikes against Islamic State targets in Iraq in June 2014. The air campaign was expanded in September 2014 to battle the militant group in Syria. As of October 6, the Pentagon said the coalition had conducted a total of 7,323 strikes – 4,701 in Iraq and 2,622 in Syria, with the U.S. conducting the majority of the airstrikes in both countries. As of September 15, the total cost of operations related to the anti-Islamic State fight was about $4 billion, with the average daily cost of about $10 million, according to Department of Defense records. Nearly 60 countries are involved in various aspects of the anti-Islamic State campaign, with about 10 countries joining the U.S. in airstrikes. The Obama administration announced earlier this year its multipronged campaign to “degrade and defeat” the Islamic State group. “This will not be quick. This is a long-term campaign,” Obama said July 6. “It will take time to root them out, and doing so must be the job of local forces on the ground with training and air support from our coalition. "It is ultimately not going to be won or lost by the United States alone. It will be decided by the countries and the communities that terrorists like ISIL [IS] target," he added. The campaign includes U.S.-led coalition airstrikes targeting Islamic State forces, buildings and weaponry; steps taken to root out the group’s financing, efforts to combat the extremist group’s message, and strengthening local forces for ground operations in Iraq and elsewhere. 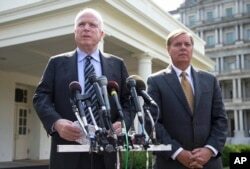 FILE - Senators John McCain, left, and Lindsey Graham, following a closed-door meeting with President Barack Obama to discuss the situation with Syria, Sept. 2, 2013. Noting the militant group’s success in reaching out to potential recruits in faraway lands, including the United States, Obama said defeating the Islamic State group will require more than military might. John McCain, chairman of the Senate Armed Services Committee and a leading critic of Obama's policy in Syria, has previously urged the president to establish a no-fly zone in Syria to protect Syrians from the Assad regime's barrel bombing. A buffer zone would allow for "an area where we can train and equip the moderates," he told VOA's Persian News service Tuesday. In early October, the U.S. announced it was abandoning efforts to build up a new rebel force inside Syria to combat the Islamic State group. A $500 million campaign that was supposed to train several thousand fighters was deemed a failure after training just 60 men. The administration said money would instead be used to provide ammunition and weapons for some U.S.-backed rebel groups already in the region. Just days after the announcement to curtail the program, the U.S. airdropped 50 tons of small-arms ammunition to rebels in northern Syria, a U.S. defense official said. Carla Babb contributed to this report from the Pentagon and Michael Bowman contributed to this report from Washington. VOA's Persian News service contributed to this story.